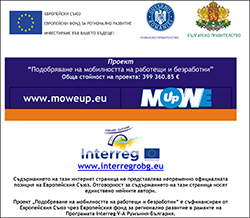 On May 22, 2017 Non-profit organization "European Institute for Cultural Tourism "EUREKA"" started implementation of the "Mobility of Workers and Unemployed Upgrade" project, acronym – MOWEUP. The project is being funded under the “Interreg V-A Romania-Bulgaria” Programme. The main objective of the project is to integrate the Bulgaria-Romania cross-border region in terms of employment and job mobility. Pilot trainings and round tables. Beneficiary 3: Chamber of Commerce, Industry, Navigation and Agriculture, Constanta.